AMEN to that! EXCELLENT advice! Lucky Mojo is proud to announce the publication of a new book by Lucky Mojo Forum Moderator Aura Leforest: "Hoodoo Spiritual Baths: Cleansing Conjure with Washes and Waters. 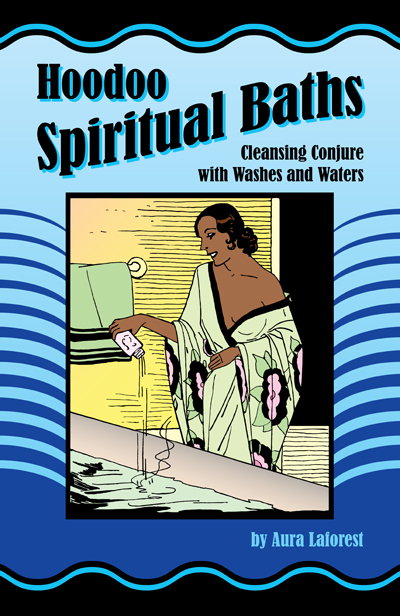 This book was written by Aura to present many facets of working with baths, floor washes, and herbal teas. It contains Frequently Asked Questions from this Forum, by YOU, our members! I recently anointed my Roomba with Chinese Wash prior to giving my room a good scrub-down, and it got me thinking about the relationship dynamic between modern technology and spellcraft. I absolutely believe in the importance of acknowledging the long-standing traditions that exist within conjure. You should not arbitrarily substitute a mop for a Roomba if you don't have an accurate understanding of how each original relationship component corresponds with one another. Otherwise, you're at risk of sabotaging your work due to blindly hedging your bets on the convenience of "modern-day" substitutes. That being said, it is safe to surmise that when the vast majority of these rituals and traditions were coming into their existence, a mop and broom were presumably considered to be at that time, for lack of a better phrase, "cutting edge". Simply being modern however is hardly the reason why something is chosen as a component in ritual. It's important to consider all of the intricacies in the symbolism that a mop and broom yield to the ritual itself, and then determine whether or not these characteristics can be found in a modernized substitute, or in this case, a Roomba. If the answer is yes, that still doesn't mean that it is necessarily appropriate to do so, as I'm reminded of the old adage, "if it ain't broke, don't fix it". If there is anything that I am certain to be true of in traditional Hoodoo, it's that everything is already in perfect divine and working order. So the question then becomes what solution is this new modern technology providing for conjure? Can modern technology provide a vessel in which traditional rootworking methods can be applied? I was thinking that investing in a "Ritual-Only Roomba" might be an incredibly useful tool to have. It could easily have it's own mojo affixed inside the mechanism safely out of sight. Anointing it with Chinese wash or any myriad of LM product combinations (especially with the mop Roomba) seems to me like it could really provide a lot of great solutions. Since it would only be employed for ritual use, the energetic vibration of the machine would automatically be raised to a higher vibrational frequency. The dirt sensor could be programmed for "psychic/energetic dirt and grime", so that it automatically targets dense energetic buildup. When it's finished doing its thing, all of your ritual remains are condensed into a highly-portable and easily disposable unit, simplifying some of the manual work involved in the disposal process, while theoretically still maintaining ritual integrity. If modernized technology has been thoroughly evaluated and deemed appropriate for the work, is having the option of integrating it into traditional hoodoo rootwork blasphemy or evolution? I'd love to hear everyone's thoughts on this, or whether I'm spouting complete heresy! Obsidian-Pizza wrote: I recently anointed my Roomba with Chinese Wash prior to giving my room a good scrub-down, and it got me thinking about the relationship dynamic between modern technology and spellcraft. ... So the question then becomes what solution is this new modern technology providing for conjure? Can modern technology provide a vessel in which traditional rootworking methods can be applied? It's been happening since forever: from Aladdin-style oil lamps to tallow and beeswax candles to glass-encased, petroleum-wax vigil lights and kerosene lamps. (Vegetable oil lamps are coming back into vogue because they are easy to customize and to make from household materials.) Likewise, the washing machine replaces the washtub for "fixing" clothes. But in each case, as you said, the adaptation has to perform the same functions as the prior tool or method -- and it tends to be adapted, and then to supplant the older method, only when the materials for the older method pass out of use and become hard to find. For example, you can still get lodestones, sold either as magical allies or scientific curiosities -- so most workers will not be buying man-made magnets for the foreseeable future. Unless, of course, they want to work Miss Cat's charming Magnetic Love Pups spell (http://www.luckymojo.com/magneticdogs.html.) Which leads us to INSPIRATION, where a worker looks upon a new device with wild surmise, as you did. I was thinking that investing in a "Ritual-Only Roomba" might be an incredibly useful tool to have. It could easily have it's own mojo affixed inside the mechanism safely out of sight. Anointing it with Chinese wash or any myriad of LM product combinations (especially with the mop Roomba) seems to me like it could really provide a lot of great solutions. I think you'll have much better success if you stick as closely as you can to the old methods with the new device. There's a mop Roomba, you say? Don't anoint the machine (by which you mean the outer casing, I suppose?). Add Chinese Wash, Jinx Killer, or whatever, to the cleaning solution. On the whole, though, many workers would be suspicious of tools that take you, your body and mind out of the process. Yes, many charms and spells require little human attention once they are set to work -- mostly house-protective charms like the witch bottle or the buried jar of lye. But these are in the minority, I think. Floor-washing has traditionally been done with the worker's full attention and prayer. The dirt sensor could be programmed for "psychic/energetic dirt and grime", so that it automatically targets dense energetic buildup. I confess to boggle-ization. How...? If modernized technology has been thoroughly evaluated and deemed appropriate for the work, is having the option of integrating it into traditional hoodoo rootwork blasphemy or evolution? It would certainly be evolution -- in the hands of an experienced worker. But I suspect mechanized spiritual floorwashing might be a dead end. Unless, perhaps, you stayed in the same room and prayed during the entire process...? This idea might be a godsend to a disabled person who wants to clear away an evil mess. I'd love to hear some input from folks who aren't physically able to scrub their own floors. Haha, now THAT would be convenient! On the whole, though, many workers would be suspicious of tools that take you, your body and mind out of the process. while he's "ghostbusting", to help harness the energy required for manifesting whatever your desired outcome might be. What is so nice about scrubbing the floors in my opinion is the feeling of exerting physical energy towards my desired goal (ironically, that's the worst part about cleaning a regular dirty floor!). Sometimes I like to visualize my "elbow-grease" as raw power being converted and released into energy that strengthens my intent. I really like this feeling, but it's also easier for me personally to enter a trance-like state when some sort of physical exercise is involved. You just turn the knob to metaphysical mopping instead of the physical dirt option! Seriously though, I feel like a Ritual-Roomba that has been equipped with a mojo bag should be treated like a spiritual being (much like how mojo bags are), and as such would need to be programmed with my intent prior to using him. Because it would be treated as a spiritual vessel under my direction, my thoughts and beliefs regarding Ritual-Roomba will directly affect its reality, and therefore my own. If I program my Ritual-Roomba to become an "energetic cleanser" that targets and destroys psychic grime and buildup, it will be incredibly easy for me to visualize this happening while he's in action, much like how I visualize my own physical energy being transformed into a ritual "fuel" of sorts. I also know that spirits love taking energy from electronic appliances when they are given permission to do so. I feel very confident that Archangel Michael would LOVE being able to draw some power from Ritual-Roomba in order to aid and support in ritual! The idea of creating spiritual resources out of everyday household items is not foreign to me. I made a numerology clock out of an old, 24-hour digital alarm that is set to an arbitrary hour. It's sole purpose is to act as a divine spiritual messenger on the behalf of the universe and my spiritual allies, for them to use at their leisure in order to convey very precise messages to me. The clock's physical vibrational frequency is so high, it flickers, similar to as if a hologram's source had been bumped into slightly. This strange physical phenomenon is undoubtedly due to the increase in the vibrational rate of the physical matter of the clock itself, causing it to almost look like its vibrating. Spiritual matter has a higher vibrational rate than physical matter, so it only makes sense that these "spiritual use-only" objects over time will gradually begin to develop a frequency that is somewhere in between physical and spiritual matter, making their spiritual roles and tasks at hand significantly easier to carry out. This idea might be a godsend to a disabled person who wants to clear away an evil mess. I'd love to hear some input from folks who aren't physically able to scrub their own floors. This is a GREAT idea, I second that notion! I hope someone here could help clear up a little bit of confusion for me. The directions for the 13 Herb bath include reciting the 37th Psalm 13 times( once for each time a person submerges their head in the bath water). I've been reading over this Psalm in preparation for using the herbal bath and I wanted to know if the entire Psalm must be recited or just the first part of it. I want to get this right when I go to take the baths over a 13 day period. I personally read the psalm from beginning to the end. For your case (13 herb bath over 13 days), reading the whole psalm as suggested by Sarafina would probably be wise. That said, in many cases with bathing, only the relevant portions of a psalm will be selected and recited. Psalms often used in their complete versions rather than in excerpt form include 37, 23 and 91. Sorry it this has already been asked,I search but didn't find anything. A bit of background:I perform very little magic and when I do it's always on the positive side. I don't suspect I've been hoodooed.Although I'm around a lot of mean-spirited people I sure none of them have been burning candle on me.Any work done on me was probley unintentional.I'm totally comfortable working with spirits from any tradition,if needed. It will take care of everything that you mentioned 9and more). I second Miss Aida on that - 13 herb spiritual bath is an amazing formula for all-round general cleansing as well as to get rid of any mess one might have picked up. How many days would you recommend I bathe? 13? Also,I know I need to change my bed sheets the night I bathe,but do I need to change them every night.For example,if I bath for 13 nights,do I need to change my sheets 13 times? Sorry if it's a stupid question. if you're generally in good shape spiritually, a single bath would be fine. Thirteen days of bathing is usually reserved for when you're quite crossed up or have been having chronic problems for a while. For the bedsheets, it isn't a necessity to change them the night you bathe. These baths (specifically the cleansing ones) are usually done prior to sunrise and then the bath water is thrown into the rising sun. It is therefore customary to dress in clean clothes for the day after the bath, but there's no ''rule'' about bedsheets (although it would be nice to launder them and add a bit of the bath tea). Thank you both. I'll be sure to do that. I wish you both very well. My cat just brought a huge black bird in to the house and it died on the stairs. I am aware that such things are usually classed as very negative, so I made a wash from hyssop and scrubbed the carpet on the stair that the bird died on. I then sprinkled salt at all four corners of the house starting upstairs at the back and working down and forwards, I then sprinkled salt on the front door step. Are there and LM products that you could recommend to go along with this? For your purpose, I'd suggest any bath crystals that are used for cleansing, particularly camphor & eucalyptus (listed here for purchase: http://www.luckymojo.com/mojocatbaths.html), or the traditional Chinese Wash (http://www.luckymojo.com/chinesewash.html). Once you feel like your space has been sufficiently cleansed, you can follow up with Peace Water (http://www.luckymojo.com/peacewater.html) in order to ensure that only harmonious spirits remain in the house. Blessings to you. ProfessorAmes wrote: I'd really recommend that you both take part in the whole ritual - lighting the bath candles together, drawing the bath and even the disposal process. I think it would be quite powerful to pour the water over each other. Another option is to use those blends in different forms. So maybe the bath is focused on washing away the past and doing healing, then use sachet powders after your bath for Healing (or use Chuparrosa) and maybe plan for a nice sensual message adding a bit of the Fire of Love or Lavender Love drops to a massage oil. I love this, Professor! Makes me think of the good fairies at a fairy-tale christening, each with her own gift. I've been reading through the posts and just want to verify that it's okay to take a shower with the 13 bath mix- I can not take a bath in my house. Also, if I want someone to leave what can I put in their wash or rinse? But I think they are protected- so how can I unprotect them? (I've tried Hot Foot Oil on their door way floor....Thank you! (you had the right idea). Not much you can do to unprotect. But, protection spells don't last forever. I looked at the page describing how to use ritual washes, and I wanted to ask: are you allowed to pray something other than the Psalms? I know Psalms are traditional, especially Psalm 23, but I don't remember it off the top of my head, and I feel like reading it while I wash would be distracting. So could I pray a mental rosary while I wash? You could pray a rosary or any heartfelt prayer thespianism - there's no ''rule'' requiring you to pray the psalms, they're simply a popular choice. Hi, could anybody tell me if it is safe to use the bath washes (mainly the 'Uncrossing' one) if you are menstruating? I know that must sound silly, but I was wanting to do some more uncrossing baths again, as I believe I have unknowingly crossed myself. However, it is that time of the month for me, and I wanted to 'cleanse' myself from bad luck again, but am worried that it won't work because of this. Can it be done? Thanks. I have never heard that spiritual bathing while on your period is unsafe -- but i have frequently heard that spiritual bathing after your period is highly rcommended. is it alright to set up things like incense cones, carvings in a candle, or writing on paper before the dawn bath portion of the spell? or is it best to wait to do those things until after? I have an allergy to cinnamon, is there a substitute? It's always prudent to prepare beforehand. Are there products/ingredients sold by Lucky Mojo with expiration dates? How long should I hold onto oils, herbs, etc. Should anything be discard after sometime of non-use? I dont know the exact answer but I think a product should be used within reason. A year is reasonable. I have had oils for over two years and in tact, same with dried herbs, but you can see the color and sent fade and thats when I would change them out. Same with the powders you can see a change in the color over time and thats when i would replace. But rather then waste them find ways to use them before they reach that level! Extra oil left? add it to bath salt and make a bath, add it to candles, powder left? dress items with it, sprinkle it in places related to the work, double dress candles. I'm disabled and it is almost impossible for me to do the protection baths I am required to do before doing dark spells. Is there any alternative to the regular protection and hyssop baths? I tried just anointing myself with lots of Fiery Wall Oil once and it did not work - I had some nasty backlash after I did the work. I also tried a sponge bath once and I had the same problem. Can anyone help? You can take a shower and just pour the dissolved ingredients with water over you. That's what people do when they don't have bathtubs. If you still have questions after reading this, please don't hesitate to ask. Also can herbal bath water effect other people because my grandma told me that she found money in the house today? It was a large amount too. Is it because I poured the water in the back garden? I currently live with her and I'm wondering if this is possible? Maybe you figured out a way to make money grow for everyone in the household! If you want something to stay with you, it goes in the back. If you want something to come to you, it goes in the front. But putting it in your garden (although we aren't taught to do this) seems like a very good idea (considering the results you got! Please keep us posted if you get more results like this. I was wondering if someone can recommend some root work for healing. In the past year and a half, I've gone through a separation from my husband of 14 years since then I went into a deep depression which has impacted my work, friendships, relationships, etc. I met a wonderful man and we got pregnant then I had a miscarriage -- so talk about a lot of loss and grief. I see a therapist, however I haven't been able to shake this depression and grief. I haven't been crossed (had a reading done) i just been dealing with life. I looked over all the different washes, herbs, powders etc, however I am not sure which is the best route to go for healing my grief and depression. Any recommendations would be greatly appreciated. P.S. I ordered chinese wash to cleanse my home and to bring back happiness, tranquility, etc...i think my sadness and depression is affecting my home with negativity. I am so sorry for your loss, Daxialuna. As you continue your therapy sessions you may consider working with Blessing, Healing, and Clarity Bath Crystals. If you are one that is comfortable with working with saints I would invite you to consider praying to Our Lady of Grace to aid. Another saint I would invite you to look into, who was canonized by Pope John Paul II in 1994, is Saint Gianna Beretta Molla. Bring the water to a boil, turn off the heat, and then steep the herbs in it for 13 minutes while praying for mental relief and for the lifting of your depression. Pray for calm, for peace of mind and for the easing of your sorrows. Strain the tea, compost the hervs and if desired, you can add a drop or two of Rose of Crucifixion oil to the water. Add the tea to a full bath. Thank you everyone for your help and suggestions. Aura: The bath you recommended i noticed the yarrow blossoms is to bring in a new love. I am still with my bf (we had a miscarriage) and I am not trying to get rid of him, if anything drawing him closer. We are looking to try getting pregnant again in the near future, I just want to make sure before we try again I have put this grief and depression behind me. So the bath you recommended is still appropriate? unless you have another suggestion. Thank you for taking the time to reply and for your well wishes. Yarrow is also for Courage and overcoming fear (or negativity) and strengthening yourself, so the bath is still appropriate for you And the Violets are for attracting love and romance.. it's not necessarily to attract a NEW love, but more love.. and the mint is a protective and calming herb..
Just wondering. I love LMCC's bath crystals. Absolutely love 'em. Sounds like a great idea, but the truth is that in 25 years, very few people have ordered that love bath special! So, not plans to do the same for the other types. Just a sales experimentthat bore little fruit. I am noticing that a lot of the ingredients in protection baths are the same as those in uncrossing baths. Are these baths interchangeable? Can I use the 13 herb bath for both protection before a dark ritual or general weekly protection and for a series of uncrossing baths? Can I use these herbs in general for both purposes? I know that cleansing is a different issue, but I'm wondering about protection and uncrossing. Therefore, you cannot use them interchangeably. Where do you guys dispose your left over bath from your uncrossing spells? Would there be any adverse effects to dissolving some bath crystals in a bottle of witch hazel? Seems a good way to be sure they are directly applied to my target's face and body, but I'm not sure what exactly would happen. Maybe the two don't mix. I might have to experiment with a very small amount. Alcohol-based substances are sometimes used in tinctures, but using witch hazel as a carrier to get the salts onto your target may not be the best way to go. You might want to dissolve them into shampoo, conditioner or liquid soap that your target is using instead. Welcome to the forum! If you get a chance, please introduce yourself on the introduction thread. You would not bathe in the negative bath salts for negative work. It's used for laying tricks. There's many reasons for not looking back. One is casting doubt on your spells. Another reason involves the man at the crossroads. Yesterday I started cleaning herbal at dawn and then cleaned my house with the LM wash.
My rootworker said to take the rest of the baths around sunset. Problem is, the white candle that I left after my bath and cleaning my house, it took hours to be out on its own, so for me to have it on after sunset I'm afraid I will fall asleep on it. Can I just take the bath in the morning? You can put it in a safe place, like inside your bathtub (away from the curtains! Just tie them up) or in your sink. That's what I do when I have them on when I'm asleep or out. You can put it ontop of a cookie sheet too. If your rootworker said to take the baths at sunset, then follow those directions. There is a reason for that timing, and you don't want to change the spell by altering the details. For your candles, you can put them in the bathtub or sink in a heat-proof dish. If in doubt about any of the specifics of your work, consult your rootworker. Is it better to wait until after menses to do a hyssop cleansing bath especially if already fatigued? Or will the work be more or less effective during this time of the month? There is a belief that a woman's spiritual energy is actually heightened during her time of the month, so don't let menses interfere with your timing for a cleansing bath. Your work will certainly not be impaired by this timing. i wonder is it better to use herbs in general in baths or bath crystals are just as potent? are there herbs to use similar to van van crystals?